Transit (moving) Neptune travels slowly, spending many years in one sign. The aspects it makes last for up to six months, and transit Neptune through a house can last for years. Transit Neptune can show areas of confusion, where you may see some things "dissolve" from your life, and where you can have greater spiritual awareness. When transit Neptune is in your 3rd house, it can become more difficult for you to deal with daily life, wanting your life to transcend. You’ll likely be late more and have a hard time keeping a schedule. You also have a hard time dealing with facts, and tend to take in information through your emotions and intuition. You may feel misunderstood when you try to express yourself verbally, but can use the arts as a way of showing how you feel or what you think. Your imagination increases and you can create beauty in your expression. When transit Neptune is in your 5th house, you love romance and dating, but you may not see your romantic interests for who they really are, viewing them with rose-colored glasses. You can have a hard time falling in love with the right people, people who deserve it and won’t take advantage of you. You want to save those you love, and will sacrifice yourself to do so. You’re highly creative, and new hobbies can be creative or in the arts. When transit Neptune is in your 6th house, you have a hard time adhering to your normal routine, and can be unreliable with mundane work. You may go into work that’s more creative, in the arts, dealing with feet, water, or the metaphysical, or helps others. You’re more sensitive to medicine and drugs, so be sure you’re not taking more than you should. When you’re stressed, you’re likely to feel much worse, and it takes a toll on you physically more easily now, so keep your stress in check. When transit Neptune is in your 9th house, you want to expand your life in spiritual ways. Just make sure you don’t fall prey to someone who wants to take advantage of that. You’re interested in the metaphysical, pushing the boundaries of your beliefs. You can be more creative, especially with writing. If in school, you may have a hard time focusing on anything for very long, and may be drawn to unusual subjects. If you travel, you can experience issues, but want to go to places near water. When transit Neptune is in your 10th house, you can have a hard time figuring out where you’re going in life, what direction your life is taking, and what your ultimate goals are. You struggle to see these things clearly, and can waver for some time. You may go into a career in the arts, with feet, water, or the metaphysical, or that helps other people. In public, people can see you for who they want you to be. The elders in your life may be unreliable. You’re more imaginative than practical. 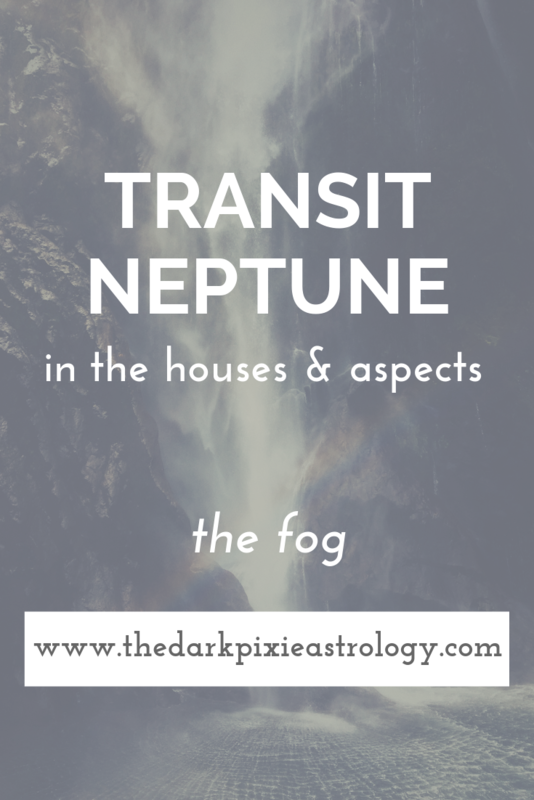 When transit Neptune is in your 12th house, Neptune is in the house it rules, so this can be an easier transit. You don’t mind being alone as much, and can enjoy your own company. You have active dreams and can get in touch with your intuitive side. Your spirituality increases, and you see the subtle messages that the Universe puts in your path. Everything is connected, and you begin to understand that now. You can also begin to believe in yourself and in that which you can’t see but know is there. With transit Neptune conjunct your natal Sun, you’re more sensitive emotionally and to the subtle shifts in the universe. You may be more imaginative, dreamy, and vulnerable, and need to protect yourself so you don’t become a victim to someone playing with you. Your identity may change, or you feel like something is challenging it and you’re not quite sure who you are. You can be more sensitive to drugs, poisons, and things that could be toxic to the body. With transit Neptune sextile or trine your natal Sun, your spirituality increases, and you feel more connected to what it is that you’re supposed to do with your life. You’re more intuitive and should try to listen to your gut because it won’t steer you wrong. You can improve yourself in some way, take some time away just to yourself, and you want your life to be peaceful. With transit Neptune square or opposite your natal Sun, you need to make sure you’re seeing reality. You could be delusional, believing in the illusions that others want you to believe, or tricking yourself so you don’t see the truth of the situation. You can be a victim or play the victim. You could be the person that other people want you to be instead of yourself. You may have a hard time understanding situations or what you want, and feel like you’re in a haze all of the time. You may have a harder time standing up for yourself or taking action, and just sit by and let life happen. With transit Neptune conjunct your natal Moon, you must be careful of whom you associate and spend time with. Neptune is a chameleon, and when it’s conjunct your Moon, you mirror the people that are in your life. Chances are, if you’re behaving badly, you need to make some new friends. Surrounding yourself with stable, positive people will help make this transit smoother. You’re very sensitive to people’s emotions and to your environment, picking up subtle energy shifts. This can be good in that it makes you more caring, empathetic, and intuitive, but it also makes you vulnerable, so take care of yourself. Women can have extra influence on you, and you may have to deal with your mother somehow. Strange illnesses that have a hard time being diagnosed can come about now. With transit Neptune sextile or trine your natal Moon, you will still be more sensitive, but better able to control your emotions and prevent others from crossing emotional boundaries. Your imagination is highly active, and your dreams are sweet and help ease your mind. Intuition is higher, and this helps in all facets of life because you can trust your gut. This is an extremely good aspect for anyone in a creative field, because you can channel all the energy into making your work better. You can be more open to the metaphysical, and healing work is good. With transit Neptune square or opposite your natal Moon, your intuition can easily lead you down the wrong path. With Neptune, it can be difficult to see the reality of situations and not the illusions Neptune likes, which can make any decisions difficult and make it harder for you to figure out which way you’re going. Your conscious and subconscious mind can blend together, causing you to have a hard time understanding the line between what’s real and what’s in your head. You’re energetically open, so you soak up other people’s moods – and problems. This can make it even more difficult on you, as you feel other people’s problems as if they’re your own, which in turn makes it difficult to sort through your own issues. There can be a tendency to want to escape, so if you go down that path, be careful of what you’re running with and to. If you can deal with the energy, you can be incredibly compassionate and tap into mystical energies with ease. Don’t withdraw into yourself too much, and try to remain as grounded as you can, keeping stable people around you and a stable routine to keep your healthy. With transit Neptune conjunct your natal Venus, you’re sensitive, compassionate, and intuitive, especially with those you love, but you’re also more vulnerable and easily deceived. You may not see people, especially those that you love, for who they really are. You may have a hard time managing your finances well, unable to understand where it’s all going. This is a great time for creativity, imagination, and inspiration. With transit Neptune sextile or trine your natal Venus, you care a great deal about others, and you can do more to help. You have an easier time with people, and feel romantic and kind. You’re artistic and imaginative, and your relationships go well. With transit Neptune square or opposite your natal Venus, you’re more open emotionally, which makes you more vulnerable to being taken advantage of or getting hurt. You can become lazy and indulgent, not wanting to deal with the practical matters of life. You want your life to be more than what it is, something magical almost. You crave more love in your life, especially if you’ve avoided it for a long time. Make sure you keep your eyes open at all times. With transit Neptune conjunct your natal Mars, your intuition is heightened. Your energy may be unreliable, and your drive could be hard to find, but your gut is pretty good. Listen to it. You can become driven to pursue spiritual matters, metaphysical subjects, or explore karma. You can be highly creative, inspired by life. With transit Neptune sextile or trine your natal Mars, you’re more compassionate and driven to help other people. You have a more gentle demeanor and treat people with kindness. Your charisma is heightened and people respond to you well. With transit Neptune square or opposite your natal Mars, your impatience can get the better of you. It’s hard for you to get a handle on your energy, or find any anywhere. You may think that what you’re doing isn’t working and want to give up, but shouldn’t. This isn’t a good time to make important decisions because you have a hard time being practical and realistic. With transit Neptune conjunct your natal Jupiter, your imagination increases, and you’re attracted to fantasy. You have a harder time dealing with reality, so it’s not a great time for anything concrete. It is a great time for creativity, artistic pursuits, and pushing the boundaries of your imagination. You can also do some travel, study metaphysical subjects, or explore your spirituality. With transit Neptune sextile or trine your natal Jupiter, your compassion increases, and you want to help people in any way that you can. You’re open to others and don’t want to engage in arguments or foster hostile environments. You can expand your life and add some creativity to make things more interesting. With transit Neptune square or opposite your natal Jupiter, you have a hard time dealing with your daily life and the mundane. You want life to be fantastical, and are unrealistic with your expectations. You may try to take risks that are too big and pay for it. This can be a good period to take a trip or to be creative/artistic. With transit Neptune conjunct your natal Saturn, your safety may feel threatened, but you should try to focus on your dreams and making them real. In doing so, you feel more in control and have less fear. The more confidence you have, the easier it is to handle. With transit Neptune sextile or trine your natal Saturn, you have an easier time dealing with figuring out how to make your dreams come true. It’s not just fantasy anymore, and you can make them something tangible. With transit Neptune square or opposite your natal Saturn, you can feel as if your worst fears are coming to life, and all you want to do is run as far away as you can. Your fear and paranoia come out to play, and you have to work hard at keeping a firm grasp on reality. With transit Neptune conjunct your natal Uranus, your creativity is heightened, and you can explore your imagination, subconscious, and spirituality in unusual ways. This opens you up to new experiences and a new outlook on life. With transit Neptune sextile or trine your natal Uranus, you can become interested in the metaphysical, or study unusual subjects, but not dedicate yourself to them for too long. You can be more spiritual and creative. With transit Neptune square or opposite your natal Uranus, you have to change the way you’ve looked at the world for a long time, or else situations will present themselves suddenly that will force you to. Your view of reality may be a little skewed as well. With transit Neptune conjunct your natal Pluto, you want to use your dreams to make a transformation, but you may or may not be in touch with reality about it. You have to make sure you’re seeing things as they really are and that this will really help. You may become obsessed with pursuing it, but if it’s not worth it, you’ll just waste your time. With transit Neptune sextile or trine your natal Pluto, you can work hard at pursuing your dreams and make them real. Your imagination is active and you can contribute to society in some way through your dreams. With transit Neptune square or opposite your natal Pluto, you can get lost to your dreams, pushing everything else aside, or struggle to get things off of the ground, blocked by something. Your imagination can take over, and reality is difficult to find.